Ada Salter’s ideas and activism transformed social and economic conditions in south-east London, and revolutionised politics in her home patch of Bermondsey and beyond. Sadly she is now, largely, forgotten. Yet, she was the first woman councillor in London and the first Labour woman mayor in the British Isles. Ada Salter, nee Brown was born in Northamptonshire to a family of Gladstone Liberals and Wesleyan Methodists. Ada joined the West London Mission to work among the London poor, where she met Alfred Salter, a student at Guy’s Hospital. At that point in their lives, Alfred was a career doctor ambitious for research, fame and fortune. When they got together Alfred converted her to socialism, she encouraged him to become a Christian and together they joined the Peckham branch of the Society of Friends, after which they both decided they should dedicate their lives to helping the poor. Alfred rented out a shop on Jamaica Road and turned it into a surgery. Within a few weeks Alfred was so successful that he soon needed to recruit four other doctors to the surgery. The surgery was organised as a local cooperative and the five doctors shared their takings equally. Ada was initially active in the Liberal Party and also joined the Rotherhithe Women’s Association, where she became its president. However she grew disillusioned with the Party’s lack of radicalism and in May 1908 both Ada and Alfred joined the Independent Labour Party, partly because of Keir Hardie’s policies of school meals, fold-age pensions and unemployment benefits. Ada joined a women-only ‘sewing circle’ in central London, hosted by Margaret MacDonald, where issues such as the conditions for working women, provision of social housing and the suffrage were regularly debated. In 1909 Ada made history when she was elected as the first woman councillor in Bermondsey, first Labour councillor in Bermondsey and first Labour woman councillor in London. A couple of years later, during a transport strike, local employers assumed that the wives of strikers would not strike and took this opportunity for increased exploitation of their largely female workforce. They miscalculated and women started to walk out of the factories and kick started the famous ‘Bermondsey uprising’, with 15,000 strikers in listening to speakers in Southwark Park. Everywhere in the district Ada set up food relief-points so families did not starve; a task she repeated this for the dock strike the following year. With the outbreak of World War I, Ada was elected national president of the Women’s Labour League. Despite it’s focus on women, Ada was always keen to emphasise that socialist revolution was for both men and women. 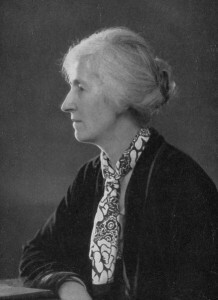 Ada was elected to the executive of the Women’s International League and attended anti-war conferences throughout Europe which called for negotiated peace. Ada also provided support for conscientious objectors and their families. In the General Election following the end of the war, Alfred was elected as M.P. for Bermondsey West and Ada became London’s first woman Mayor. In office Ada stayed true to her Quaker and socialist principle, she refused to wear the mayoral chain and robes, she replaced the Union Jack over the Town Hall with a red flag sporting the historic symbols of Bermondsey, St Olave and Rotherhithe and returned a large part of the personal expenses that had been allocated to her as mayor. Following the election, the Labour party also had a majority on the council which allowed Ada to go ahead with a massive tree-planting scheme to improve the look of the area and launched a campaign to improve public health. When the Labour Party took office in 1922 the death-rate was 16.7 per 1,000. As a result of the initiatives instigated by Ada, five years later it had fallen to 12.9 per 1,000. Ada has suffered the fate of many women in that her achievements have been overlooked or trivialised. When Fenner Brockway wrote about the Bermondsey Story it was as a tribute to Alfred, giving him sole credit for policies that were down to Alfred and Ada or down to Ada alone. Ada is reduced to a supporting role rather than being what she was, a force in her own right. When, during the Second World War bombs struck their home in Bermondsey, Ada and Alfred moved in with Ada’s sisters in Balham, where Ada died in 1942, aged 76.